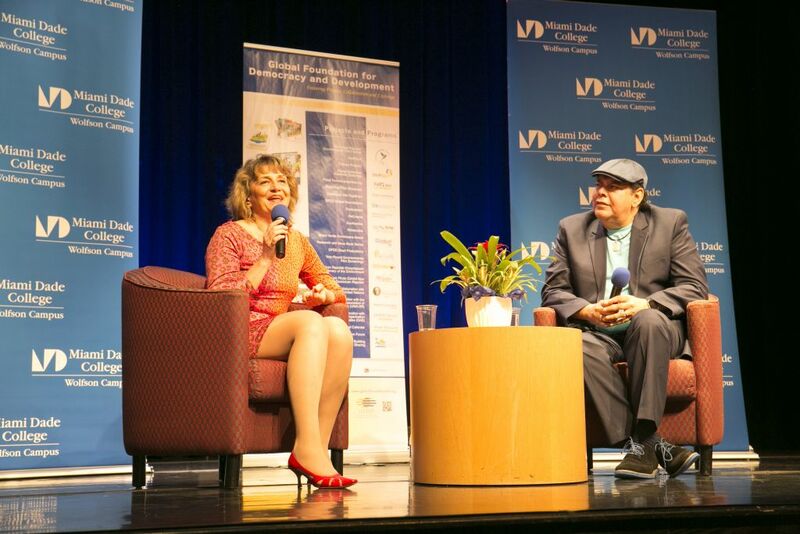 For its first Dominican Get Together of the year, GFDD/Funglode welcomed today Fernando Villalona, el Mayimbe, one of the most famous and emblematic artists of the Dominican Republic, to talk about his life and more than 45 years of musical career at the Miami Dade College. Isabel Palacio, Academic Counselor at Miami Dade College and Advisor to the insitution’s Dominican Students Association, made the introductions, praised the work carried out by the members of the Association, and pointed out the presence of Dr. Rick A. Soria, President of Miami Dade College's Wolfson Campus. "It is a great honour to have you with us tonight; the students feel honored to be able to receive some remembrance of our homeland, our culture and our history through these gatherings ", she said. Following, Natasha Despotovic, GFDD’s Executive Director, warmly welcomed the guests and reminded the audience the purpose of DGT to promote the understanding and appreciation of the Dominican culture, values and heritage, and to create opportunities for discussions of contemporary issues relevant to the Dominican society in the homeland and abroad. Despotovic thanked the representatives of Miami Dade College for “giving us the opportunity, once again, to bring this initiative and introduce figures of the level of our guest tonight. In 2013, we presented the film Sugar and in 2014 offered a very special gathering with Rafael Solano and Johnny Ventura". Before a packed auditorium, GFDD’s Executive Director, after introducing two videos, one portraying the different programs of the foundation and the other showing the artist’s career for the past 45 years, invited el Mayimbe onto the stage to reflect on his music career and achievements which have included more than 20 albums covering numerous musical styles such as merengue, cumbia, bachata, boleros and ballads. Despotovic said that sharing such a special evening with a Dominican artist that has been able to conquer the international audience, and learn about his life, his achievements and downfalls, is a great opportunity. Before the artist from Dajabón took the stage, the Executive Director of GFDD invited the audience to surprise to the singer by performing some of his songs, and three courageous spectators sang some of the artist´s most emblematic songs. As a prize, they received GFDD publications New Perspectives: Dominican Republic and Lo Dominicano I All Things Dominican. Villalona spoke about his career highlighting that "I am not ashamed of anything that I've managed to overcome". El Mayimbe started the conversation by talking about his father and the influence that he had in his artistic life and how hard it was for him when on May 5th 2015 he passed away and still he had to act on two parties that night. "You don't know how hard it is to sing and cheer the public knowing that you just lost a person as important and influential in my life as my father". The artist shared a special conversation with the Miami audience talking about the beginnings of his career when he participated to a song festival pushed by several people like the 1970´s Major of Dajabón, Rafael Solano, Marc Cordero, José Joaquín Pérez, and others. "I won fifth place and I really admired who won first place, Frank Valdezde Higüey." It was interesting to see how all the people mobilized because they disagreed with the verdict and I felt very bad that Frank was not receiving the same warmth from the audience as I was, on stage." Villalona answered questions from the audience interested in knowing more about his interpretation of religious songs, confessing that he felt a call from God to make a special christian music album, in which he recorded 22 songs prasing God. Fernando delighted the audience with his music, interpreting several among his most famous songs such as “Penélope” and “Dominicano soy”. To conclude the evening the artist took the time to pose for pictures and personally greet the members of the audience during a celebratory toast. Born in Loma de Cabrera, Dajabón, Villalona began singing at an early age in the early 1970s and became popular after participating in "El Festival de la Voz", a television talent contest for amateurs. After singing with Wilfrido Vargas in the group "Los Hijos del Rey" he assembled his own orchestra. Songs such as "Tabaco y ron", "Celos" and "Soy Dominicano”, to name but a few, became very popular in the 1980s. Following a break in his career for personal and health reasons, Fernando Villalona returned to the music industry in the 1990s, with his own rendition of Joan Manuel Serrat’s song “Penelope." "Quisqueya", "No Podrás”, “Música Latina" and "Me He Enamorado" remain some of his biggest hits from the 90s. In 2012, Villalona recorded “El Color De Tu Mirada", with composer and American singer Victoria Daly. The song was nominated for Best Music Video at the Premios Soberano in 2013.